The global trade of counterfeit goods reportedly rakes in half a trillion dollars per year, which isn’t good for anyone. (Except for the counterfeiters themselves, I suppose.) As the fakes industry continues to grow, brands are looking to technologies like RFID (radio-frequency identification) and NFC (near-field communication) to help authenticate their products. This is where Blue Bite, a startup based out of New York City, hopes to come in. 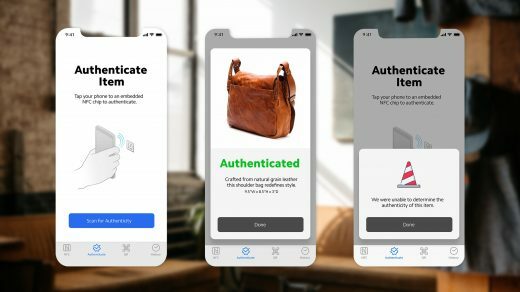 It has developed a system that relies on an iOS app, called Decode, that can tell consumers if an item is real by simply tapping their phone on it. Of course, a big concern with NFC-based authentication is that it can be exploited if the chip is exposed or if there isn’t a server verifying every certification scan. But Blue Bite claims that’s not an issue with its system because every time you tap a product like Adidas’ Telstar 18, it creates and verifies a unique authentication ID can’t be replicated by third parties. Not only that, but it helps that the NFC chip is stuck to the inside of one of the panels of the ball, making it tougher for anyone to remove and tamper with. Blue Bite says right now it’s working with about 15 companies, ranging from jewelry makers like Bulgari to fashion brand Pinko, and the hope is to add more in the near future. Still, as promising as Blue Bite’s service is, ultimately its success will depend on support from brands. And we can all agree we need an easy way to find out if what we buy is indeed the real deal. Blue Bite’s implementation of NFC will be particularly handy for those who buy a used product, or a new one from third-party sellers on sites like eBay or Amazon. Up until now, there hasn’t been an end-to-end authentication service that has been completely seamless or safe. RFID and NFC can be exploited if the chips are exposed, and brands have mostly used the technologies to create marketing experiences. Nike, for example, introduced NBA jerseys that featured NFC tags, but it wasn’t designed to be an anti-counterfeit measure. Instead, it was meant to be a door to exclusive videos, pictures and GIFs from players and team, as well as access to limited-edition shoes. Nike told Engadget at the time it was certainly looking into all options available with NFC, but there was nothing in the works using it to crack down on fake goods. Even if it tried, though, the NFC chip in Nike’s Connect jerseys can easily be removed since it’s on a hangtag, rather than part of the fabric. That means it can be tampered with or put on an item that isn’t authentic. Blue Bite, on the other hand, is able to avoid this problem by working with brands that put the NFC chips inside their actual products. The company says its Decode app offers support for all major NFC tags, such as HID, LAB ID and Smartrac, which is important because it makes it easy for brands to adopt existing formats to authenticate their products. I saw Blue Bite’s system work with Adidas’ official World Cup 2018 ball, the Telstar 18, which features an embedded NFC chip. The entire process was quite simple and only took about 10 seconds: All I had to do was download the Decode app, open it and then click on a tab labeled “Authenticate.” After that, I tapped the iPhone on an area of the Telstar 18 that’s marked by four signal waves, went to the “Scan for Authenticity” section of the app and, boom, I got a message that said “Authenticated” with a picture of the Adidas ball. You’ll also see an authentication ID, how many times the item has been checked and the first day of “digitization,” aka when the product’s NFC chip was originally scanned. Blue Bite’s offering isn’t just about letting you know if your item is real or not. 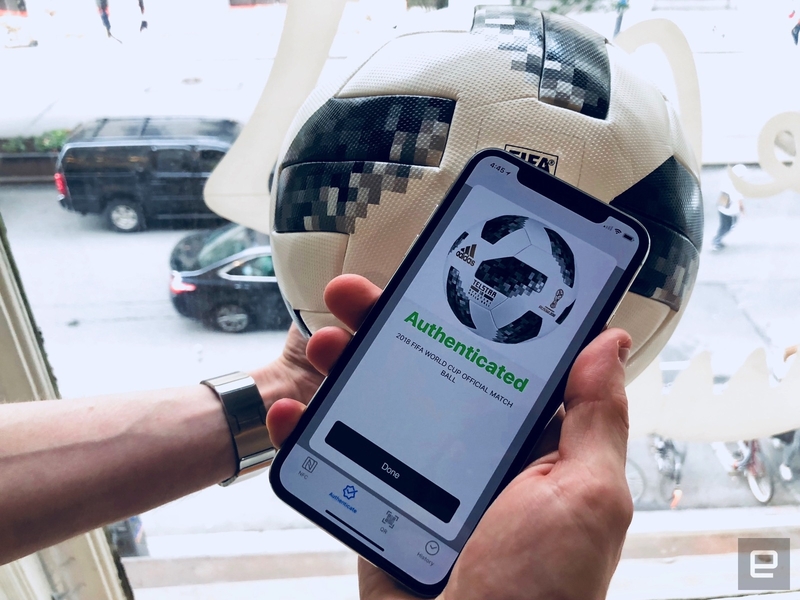 Like with Nike’s NFC-powered NBA jersey, brands like Adidas can use the same NFC chips that are on its Telstar 18 balls to give you an augmented experience (read: access to exclusive deals) via an app or the web. Let’s face it, as great as it is to be able to find out quickly if your item is genuine, you want to use the NFC tech inside it for more than that. For the Telstar 18, it would’ve been nice for Adidas to let you tap it and then, say, send you to a dedicated webpage with a history of every World Cup ball.